Kung Fu Kid, known as Makai Retsuden (魔界列伝) in Japan, is a beat-'em-up action game developed and published by Sega for the Sega Master System. 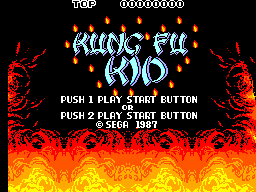 It is a sequel to the SG-1000 game Dragon Wang, in which the player reprises the role of Wang, a kung fu master. In Brazil this game was re-released as Sapo Xulé O Mestre do Kung Fu in 1995, complete with graphical changes. Main article: Kung Fu Kid/Magazine articles.